17-year-old Courteney Boyle was born with an underdeveloped brain stem and has overcome several challenges. Today, she has fun working as a barista at Invader Joe’s Coffee Shop at Normandy High School. 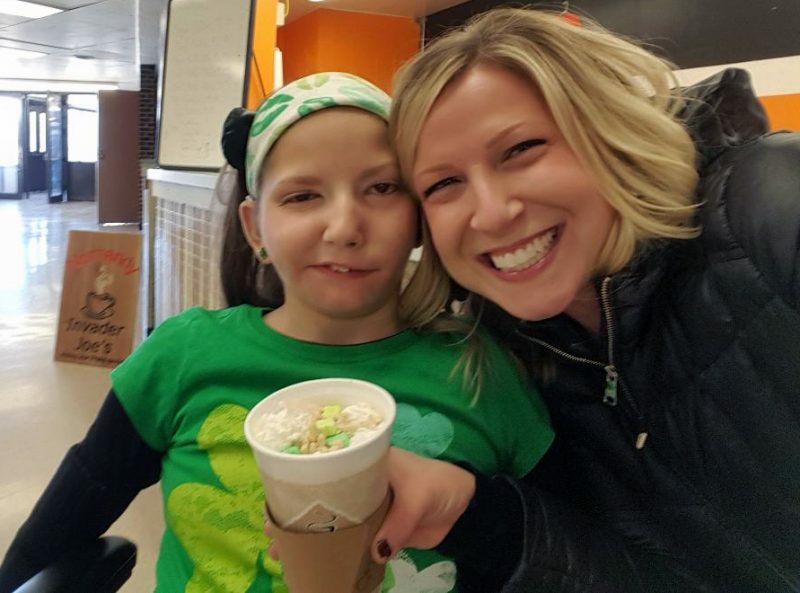 Here, she and her mom Christine show off a St. Patrick’s Day themed drink. Thanks to the Akron Children’s Hospital Palliative Care team and her family, Courtney Boyle doesn’t let complex care needs slow her down. On any given day you’ll find her running with her dad, greeting others at church or working as a barista at the coffee shop at Normandy High School. Courteney, 17, is no stranger to Akron Children’s or to the inner workings of a hospital. She was born with an underdeveloped brain stem, the most highly developed area of the brain at birth. It controls all inborn reflexes such as crying and suckling, and regulates basic life functions such as breathing, heart rate, digestion and sleep. For the next several years, Courteney went from specialist to specialist to support her significant physical, cognitive and medical challenges. She was growing, attending school and learning to communicate with others, despite being non-verbal. And, at age 5, she had something big to say. After medical consultation and her parents’ thoughtful consideration, Courteney began TPN, total parenteral nutrition. This rare feeding technique is given intravenously into a major blood vessel near the heart to get nutrients straight into the blood stream, bypassing the gastrointestinal (GI) tract altogether. Courteney and her dad celebrate a completion of the Disney Fairy Tale Challenge. Palliative Care helped bridge the gap between Courteney’s medical needs and her parents’ goals for Courteney. Prior to working with Palliative Care, Christine and her husband, Dan, had to follow strict protocols if Courteney got a fever or had other abnormal symptoms. Today, Akron Children’s Palliative Care helps coordinate care among Courteney’s multiple specialists at 3 different institutions. In doing so, Courteney can spend more time doing the things she loves most like hanging out with her cousin, Autumn, dancing and attending Young Life Capernaum Club and Camp. 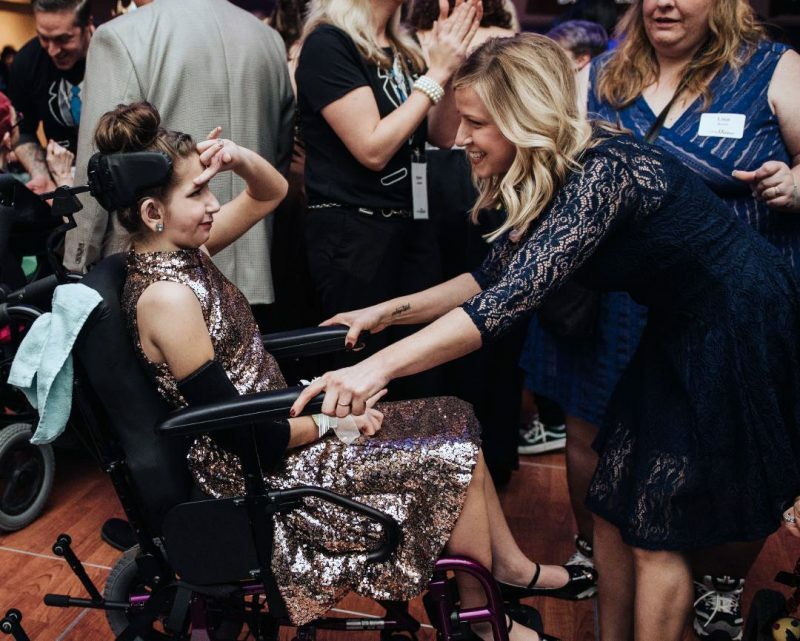 Courteney and her mom dance at the Night to Shine prom this year . Palliative Care also makes home visits to check on Courteney; advocates for her complex needs for home nursing and enhanced school support; and, helps with medication and pharmacy issues. One way Courteney’s dad embraces being a parent, is by running with his daughter. It started when he realized Courteney loved the feeling of wind in her face while being pushed in her stroller. Soon after, he started jogging with her around the neighborhood and then running in 5ks, 10ks and half marathons. 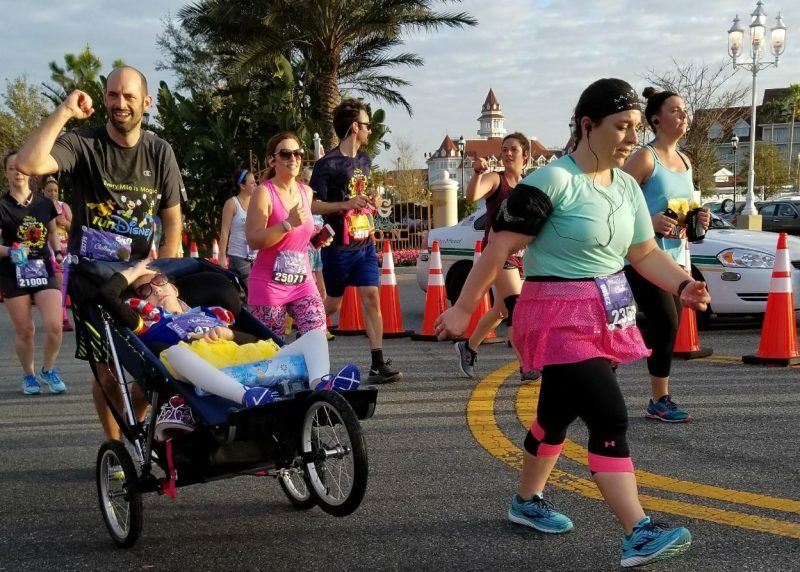 In 2016, Dan thought the duo was ready for a bigger challenge, 19.3 miles, at the Disney Fairy Tale Challenge in Florida. When his race application was rejected, he learned the race wasn’t ready for them. Dan and Courteney compete in their biggest challenge, 19.3 miles. 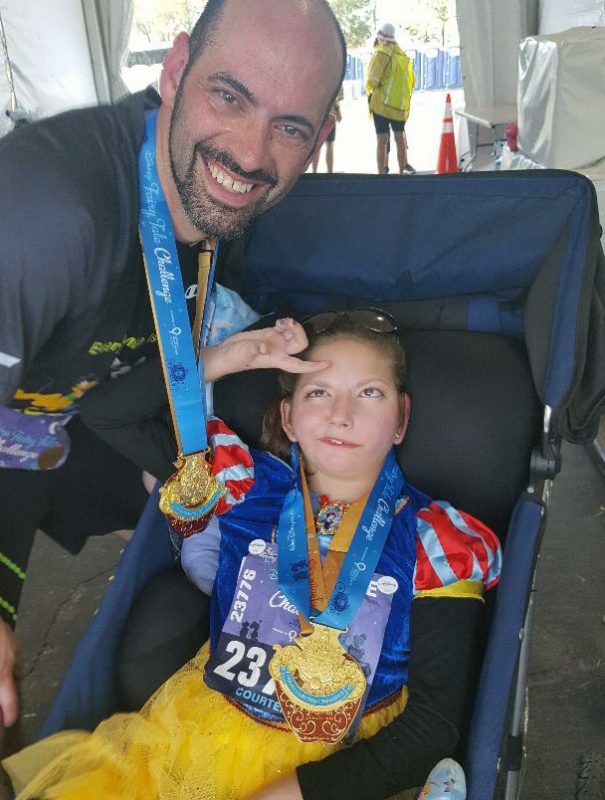 Today, Courteney spends a lot of time training and running with her dad to raise money for the special needs community through their non-profit organization, Team Boyle.